OpenRCT2 needs the object files (containing graphics, sounds and models) from the original RollerCoaster Tycoon 2 to work. You'll need to have a copy of RCT2 before beginning. If you have an old CD copy sitting around, you're good - move on to step two. Otherwise, you can buy the game at GOG.com or through Steam. The GOG version is strongly recommended for those on Linux or macOS for ease of installation. Both of the packs linked also contain the two expansion packs, Wacky Worlds and Time Twister. OpenRCT2 can also import scenarios and some graphics from the original RollerCoaster Tycoon (RCT1) - if this is something you'd like to do, get your RCT1 CD ready or purchase a copy (you can also get RCT1 through GOG or Steam). If you're on Windows, all you need to do is run the installer (whether from GOG, Steam, or your CD). Install RCT2 as normal, then go on to the next step. You can use WINE - a reimplementation of the Windows API - to run the installer. Using a wrapper such as PlayOnLinux or PlayOnMac is recommended to make the process easier. Follow the wizard the wrapper provides, pointing it to the installer at the appropriate point. It does not matter if RCT2 actually runs, as we'll be using the OpenRCT2 application. Follow a guide for installing Steam via WINE, such as this excellent one from the Arch Wiki. Download and install RCT2, remembering to note/copy the path where you installed it. The game won't show up in the 'installed' list - this is normal. Use the links below to download OpenRCT2. The latest release is a stable, well-tested build, but may have fewer features than the latest development builds. The dev builds are analogous to beta versions - they should work, but don't expect everything to be perfect. Note: If you wish to play online, it is recommended to use the latest development build, as most servers will be running this; you cannot connect to a server running a different version. When you launch OpenRCT2 for the first time, OpenRCT2 will try to find your RCT2 installation. It will check the default locations that RCT2 is typically installed for all known releases. If it is unable to find it, or you have installed it to a different location, OpenRCT2 will show a dialog allowing you to select the directory containing your RCT2 files. Alternatively, if you want the latest development build, install the -git package from the AUR. The dev builds are analogous to beta versions - they should work, but don't expect everything to be perfect. 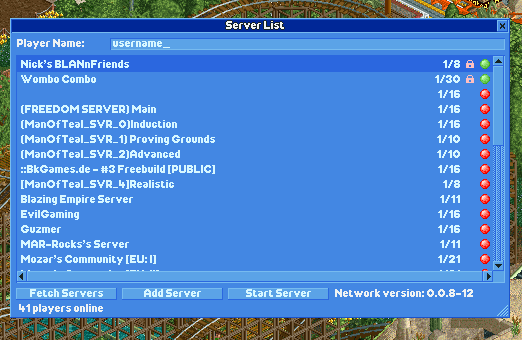 When OpenRCT2 first launches, you will be prompted to select the directory where you installed RCT2. You can also set the RCT2 path from the command line should you wish - use the command below. Alternatively, if you want the latest development build, use the live ebuild. The live ebuild will compile the latest dev version, and although they should work, it may not always compile (when upstream build has changed but the ebuild hasn't caught up yet). You will need the dependencies to build the game - there is no package for the game as of yet. You can obtain the latest release or develop version of OpenRCT2 from the OBS. You can obtain the latest release or develop version of OpenRCT2 from this PPA. The installation is currently based on your nixpkgs-channel. If you're using the unstable channel, just install the package. If you're on an stable channel (like 17.09 or older) you can install this single package from the unstable channel. Alternatively you can build the expression from the nixpkgs. OpenRCT2 can pick up RCT1 scenarios, title sequences and image data (giving improved appearance to some roller coaster types). To do this, follow the steps below. Firstly, install or extract RCT1 (follow the instructions in step 2, substituting the RCT1 installer for the RCT2 one). Launch OpenRCT2 and go to the Options menu (top right on the title screen). Go to the sixth tab (the spanner), and click the box under Path to RCT1 installation. A folder selection dialog will pop up - navigate to the folder where your RCT1 files are and click 'Open'. You can play OpenRCT2 online in collaboration with others! To do so, click the third option on the main menu, which will bring up the server browser. The server browser allows you to set your player name (by default your computer account username), select a server to play on or create your own server. Note the red and green circles on the right hand side, and the text in the bottom right referring to the network version. You can only connect to servers that are on the same network version as you. Hovering over the circles will tell you what version the server is running. If it is higher than yours, update your copy of OpenRCT2. If it is lower than yours, you'll need to contact the server admins and ask them to update. A full technical guide to multiplayer which includes instructions on setting up a server is available here on the OpenRCT2 wiki.